Our Exhibit will highlight the programs, spaces, artists and makers that are associate with the Artisan Alley. Artisan Alley is a rich and bustling creative environment where individual artistic pursuits come together into a collaborative and energizing space where creative ideas become a reality. Our warehouses, located on the south side of Bloomington, Indiana, are an expansive venue combining a variety of spaces that are perfect for creative businesses, permanent artist studios, a gallery, performance space, ftness and dance classes, art workshops, lectures and private events. We are now offering access to Burl & Ingot, our wood and metal shop, starting December 1st 2015. We will host classes and community nights for anyone curious about learning more. In addition to our member-based Tool Sharing Library, where community members can borrow our basic tools or loan us any of your unwanted tools, Burl & Ingot also has available artist studios, a communal multi-purpose member space for building and learning, and is a great environment for workshops and educational lectures. EFF 5 Robotics will be demonstrating First Tech Challenge robotics, RepRap 3D printing, and basics of design using CAD software. The robot and the 3D printer were both built by team members. The team will have 3D printed items such as earrings and key chains for sale to raise money for the 2016-2017 competition season. Guest will be able to drive a robot, learn about First Robotics, the building and operation of an cartesian style 3D printer, and try their hand at basic CAD design. Indie Ninja Design exhibits will include an interactive demonstrations of the games “Hivez” and “Evil Genius”. These are two board games designed by a local Bloomington maker. Copies of Hivez will be available for purchase. We will also have blank cards and markers available so that attendees of the convention can design their own cards for the game. Beauty and Belongings: Handcrafted baskets, bowls, and trivets from 100% cotton clothesline with demonstration. We’ll be holding ongoing booth demonstrations. Discardia will be providing materials and instruction to make water bottles from re-used glass bottles and bicycle inner tubes. MCPL plans to bring two different tech setups to share with the public. Both will be interactive. The first will be an audio production rig. This will include a guitar, midi keyboard, and microphone all hooked into Garageband. Folks can stop by and record a song and mess with some of the effects on the keyboard and in Garageband. The second setup will be a demo of the library’s new HTC Vive virtual reality headset. We will have signups and/or form a line for participants to take turns trying out the virtual reality system. There will also be a monitor up for folks to see what the experience looks like to the person using it. The MILL is a new, small makerspace at the School of Education. They’ll talk to folks about what they have available and have a few projects and demos. Become an “epic engineer” at WonderLab’s Epic Fun Park Challenge by helping to build a huge roller coaster out of paper! Restructify is a slang term for recycling, upcycling, refurbishing , and reinventing reclaimed objects into industrial, steampunk, and unique, funky pieces of art. Come check out their upcycled pieces of artwork. At the florum metal jewelry booth, we will be showing attendees how to cut, file, and sand sheet metal to create jewelry pieces and teaching wire working skills such as chain making and wire forming. 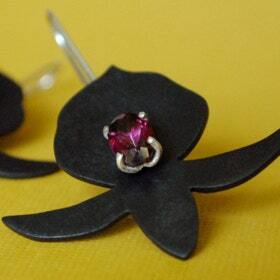 florum metal jewelry will be selling their handmade metal jewelry at the booth.